In last week’s post I showed some high-speed photographs of the plain water jets that come from the small diamond and sapphire orifices and that are useful in cutting a wide variety of target materials. Before moving away from the subject of high-speed photography, this post will use results from that technique to talk about why pressure washer nozzles may not work well, and have limited range. From there it will raise the topic of adding abrasive to a waterjet stream. Most of us, I suspect, by this point in time, have used a pressure washer to do some cleaning, typically around the house or perhaps at a car wash. The jet that comes out of the end of the nozzle is typically a fan-shaped stream that widens as the water moves away from the orifice. This flattening of the jet stream, and the resulting spreading jet is achieved by cutting a groove across the end of the nozzle to intersect either a conic or ball-ended feed channel from the back end of the nozzle. Figure 1. Schematic of how a fan–generating orifice is often made. One of the problems with this simple manufacturing process is that the very sharp edge that is produced to give a clean jet leaving the nozzle is very thin at the end. This means that with water that is not that clean (and most folk don’t filter or treat pressure washer water) the edge can wear rapidly. I have noted several designs (and we tested many) where the jet lost its performance within an hour of being installed, particularly with softer metal orifices. And in an earlier post I did show the big difference between the performance of a good fan jet and a bad. So how do photographs help understand the difference, and explain why you should generally keep a fan jet nozzle within about 4-inches of a surface it you are trying to clean it. That does, however, depend on the cone angle that the jet diverges at, once it leaves the nozzle. We found that a 15-degree angle seemed to work best of the different combinations that we tried. If the jet remained of sufficient power, this would mean that it would clean a swath about half-an inch wide with the nozzle held 2-inches above the surface. At 4-inch standoff it will clean a swath about an inch wide, and at 6 inches, this goes up to over an inch-and-a-half. But that would require that the jet be of good quality, and evenly distributed. Figure 2. Back-lit flash photograph of a fan jet, at a jet pressure of around 1,000 psi. It is less than 6 inches from the end of the orifice to the rhs of the picture. In Figure 2, the lack of water on the outer edges of the stream shows that the water is not being evenly distributed over the fan. As the water volume leaves the orifice, the sheet of water begins to spread out into the wider, but thinner, sheet that forms the fan. But as it gets wider it also gets thinner, and, like a balloon, water can only be spread so thin before the sheet begins to break up. As soon as it starts to do so, the surface tension in the water causes it to pull back into roughly circular rings of droplets. Figure 3. Fan jet breakup from a spreading sheet into rings (or strings) of large droplets that rapidly break down into mist. These droplets start out as relatively large in size, but they are moving at several hundred feet per second, and as single droplets moving through stationary air the air rapidly breaks them up into smaller droplet sizes, and then into mist, while at the same time slowing the droplets down. The smaller they get the quicker that deceleration occurs. When droplets get below 50 microns in size they become ineffective. (From a study that was done on determining the effect of rain on supersonic aircraft). Figure 4. 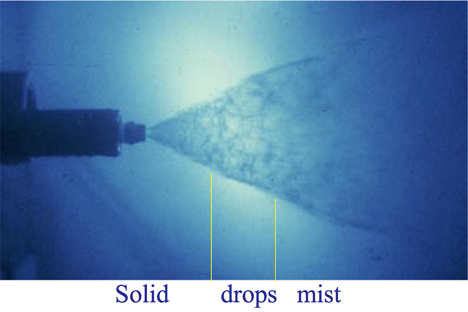 Showing the stages of the fan jet breakup from a solid sheet to mist that does little but wet the surface that it strikes. 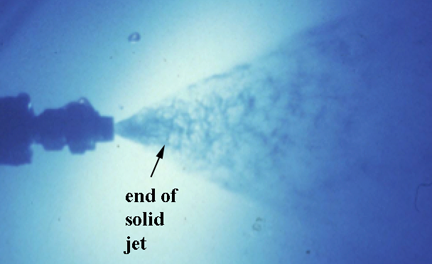 However, if the nozzle is held just in that short range where the droplets have formed, but have not broken down, then the jet will be more effective than it would have been at any other point along its length. This is because of something that was first discovered when scientists at the Royal Aircraft Establishment-Farnborough and at the Cavendish Lab at Cambridge University were studying what would happen if they flew a Concorde into rain, while it was still going supersonic. (They actually tried this in a heavy rain storm in Asia and found it was a seriously bad idea). The pressures that can develop under the spherical droplet can exceed twice the water hammer pressure so that the impact pressure on the surface can exceed 20-times the driving pressure supplied by the pump. But the region effected is very small, and the effect diminishes as the surface gets wetter. And the problem, as with all waterjet streams, is that it is very hard to know where that critical half-inch range is. It varies even within the same nozzle design models due to small changes on the edge of the orifice. And as a very rough rule of thumb, a perfect droplet moving at a speed of around 1,000 ft/sec will travel 138 diameters before it is all mist. Most drops aren’t perfect and thus will travel around 30 – 50 diameters and once they turn into mist they will decelerate to having no power in less than quarter-of-an-inch. The implication of this, which we checked with field experiments, is that if you hold a pressure washer nozzle with a fan tip more than 4-6 inches from the target you are largely just wetting the surface, and spending a fair amount of money in creating turbulent air. This story of jet breakup is a somewhat necessary introduction to two posts that I will be along before long. The first will be to discuss how we can use a different idea for nozzle designs to do a much better job, at greater standoff distances, and I will tie that in with some of the advantages of going to much higher pressure to do the cleaning job. The other avenue that this discussion opens relates to how we mix abrasive within the mixing chamber of an abrasive nozzle design, and that will come along a little later.